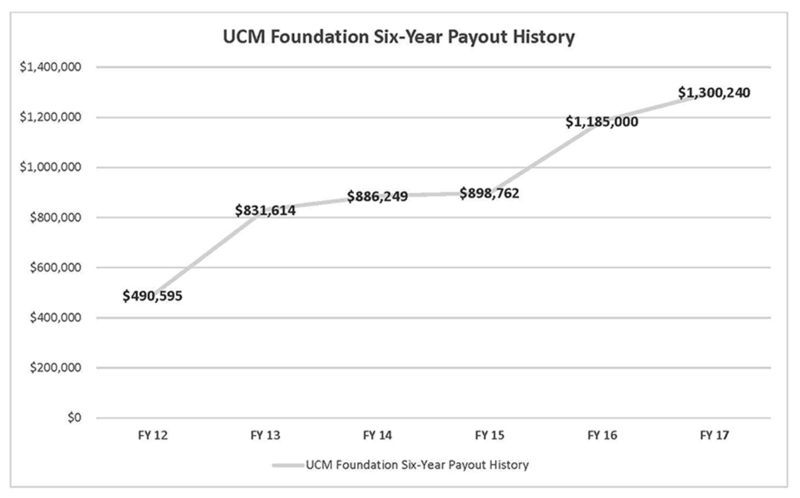 The UCM Alumni Foundation broke another record—increasing the payout from its endowments in support of students and academic programs to an all-time high. The Foundation Board of Directors authorized a payout of $1.3 million for fiscal year 2017, which is a 9.72-percent increase from FY16 and nearly triple the payout since FY12. This is the fifth consecutive year the payout increased. 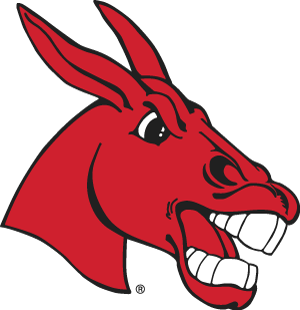 “At a time when access and completion of college is a national priority for students and their families, the support of our alumni and friends providing scholarship assistance in a way that makes a historic difference at the University of Central Missouri is deeply appreciated,” said Charles Ambrose, UCM president. While UCM’s average student debt load continues to be lower than most due to the University’s commitment to keeping tuition affordable, the national student debt load surpassed a record $1 trillion in 2013, according to the Consumer Financial Protection Bureau. Drummond noted that several years of astute financial planning by the Foundation Board contributed to the consistent payout rate increases, which are calculated from the earnings on the nearly 500 endowments managed by the Foundation. Watch this video produced by alumnus John Kennedy '92, ’13 about the honoree. Read the feature that appeared in the UCM Magazine. Brig. Gen. Troy Kok, who earned a bachelor's degree in aviation maintenance technology in 1986 and a master's degree in aviation safety from UCM in 1987, received the 2015 Distinguished Alumni Award Friday, Oct. 23, as part of the week’s Homecoming festivities. Kok currently serves as deputy commanding general of support for the U.S. Army Recruiting Command at Fort Knox, Ky. Kok, who also serves as a senior aviator in the U.S. Army Reserves, has been responsible for 215 aircraft and more than 4,500 soldiers and civilians in 14 states, providing executive-level advice to senior members of the U.S. Army Reserve and leadership on aviation-related matters. His military career started out at UCM, where he was commissioned through the ROTC program as a second lieutenant in 1984. Following his graduation, he became a platoon leader for the 219th Transportation Company at Scott Air Force Base in Illinois, then went on to attend flight school at Fort Rucker, Ala. In addition to his UCM education, he advanced his military career by completing the Master of Strategic Studies program at the United States Army War College. During his career, Kok has managed more than $1.5 billion of aviation assets and commanded seven times, including a battalion of AH-64D Longbows, the most advanced attack helicopters in the world. In addition to holding a military rank held by less than one percent of those who serve in the Army, Kok has received numerous military honors, including six Meritorious Service Medals, two Bronze Stars, the Legion of Merit and the Defense Superior Service Medal. In addition to his military service, Kok continues to stay engaged with the current Army ROTC students at UCM and his fraternity, Delta Chi. 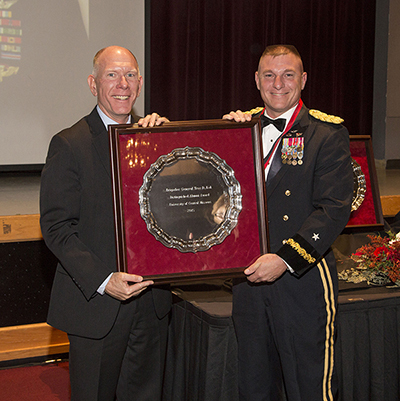 Proud of his connection to the university, particularly the ROTC program, Kok noted in a statement about what UCM means to him. "The impact that the UCM education has had on the success of my career, in both my military and civilian life, has been insurmountable. The five years I spent at UCM thoroughly prepared me for the challenges I would face as I progressed through my career in the military." Watch this video produced by alumnus John Kennedy ’92, ’13 about the honoree. The 2015 recipient of the Distinguished Alumni Award for Service was Tom Wyrsch, a Kansas City resident who earned a bachelor's degree in political science from UCM in 1978 and current director of contract compliance for Jackson County, Mo. 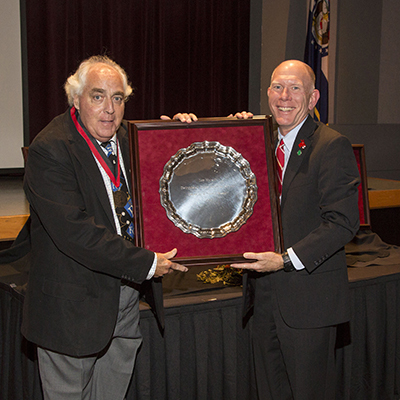 He was honored during the annual Distinguished Alumni Dinner Oct. 23 as part of the week's Homecoming festivities. An active and loyal supporter of UCM, Wyrsch has been a member of the UCM Alumni Board of Directors, including serving in leadership posts as president and executive committee member. The longtime Kansas City resident has been involved in government and politics for more than four decades. Since his graduation from UCM, he has worked on the state and national levels for many congressional staffs and is currently chair of the Jackson County Democratic Committee. He has served as the county's director of contract compliance for eight years. Wyrsch is also active in his community and has been involved in many Kansas City competitions, celebrations and sporting events. In addition to raising funds for groups such as the Muscular Dystrophy Association, over the past 34 years he has been involved with the Kansas City St. Patrick's Day Parade, including serving as grand marshal in 2001. Additionally, he has been a judge of the Great Lenexa BBQ Contest, was logistics chair for the American Royal Parade, and helped with the Kansas City Zoo's Jazzoo Festival. One of eight children, he is passionate about his family's heritage and values his work with the Irish community efforts in which he takes great pride. In discussing his UCM experiences, Wyrsch values the lifelong friendships he made, particularly through his involvement with Delta Upsilon fraternity. He credits UCM for the disciplines and lessons taught by great professors that carried him through his career. 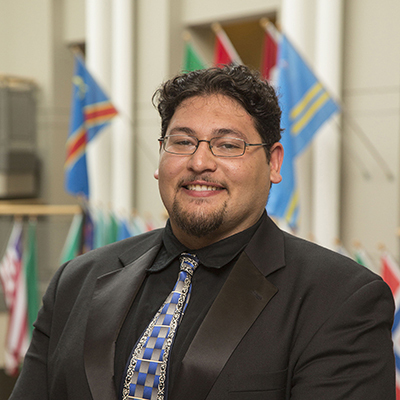 "My involvement in SGA (Student Government Association), theatre and other activities was invaluable," he added. "Sometimes you don't realize it at the time, but later, you realize it when something comes up and you understand that you learned it or were first exposed to it through your classes." Aubrey Winn, the 2015 Charno Award recipient, studied public relations at UCM with a minor in psychology and corporate communications. A native of Columbia, Mo., Winn chose UCM because it was reasonably priced and “not too far from home.” Winn has been a member of multiple student organizations including Red Lead, Student Ambassadors, IMPACT retreat, Alpha Sigma Alpha and the Panhellenic Council. “The best part about my time at UCM has been the organizations that I’ve had the chance to get involved in through the last several years. I’ve been able to discover my passion and future career aspirations of working in student affairs in the higher education field,” she said. In 2014, Winn received the Martin Luther King Jr. Freedom Scholarship for her active role in leadership positions in campus organizations and community projects. “Receiving this scholarship meant that I had to spend less time stressed about money and nuances and got to spend my senior year focusing on school, organizations and making lasting memories! I am thankful that I received a scholarship and was able to fully enjoy my time at UCM,” she said. 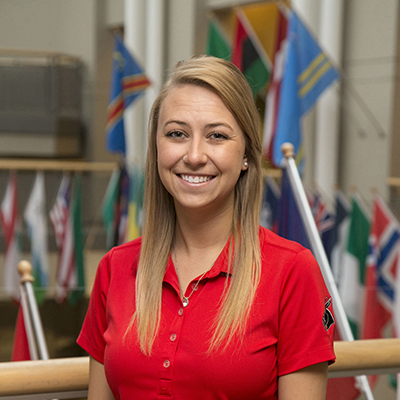 After graduation, Winn hopes to pursue a career in the student affairs higher education field, working specifically with fraternity and sorority students on campus. Read the feature that appeared in UCM Magazine. 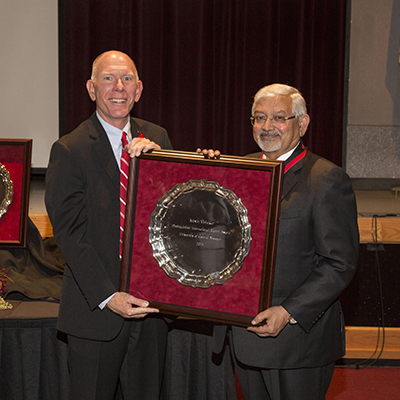 The 2015 Distinguished International Alumnus was Ashvin Vibhakar, Ph.D., a resident of Little Rock, Ark., who came to UCM from India to complete a Master of Business Administration in Finance degree in 1973. Since August 2015, he has served as the Joe T. Ford Chair of Finance at the University of Arkansas at Little Rock, having recently retired as managing director and senior advisor, executive sponsor for the Future of Finance Project, CFA Institute, in Charlottesville, Va. A chartered financial analyst, Vibhakar retired in August from the CFA Institute's Future for Finance Initiative, a global effort launched in 2012 to shape a forward-thinking financial industry focused on better serving society. Before coming to UCM to earn an MBA, he completed a bachelor's degree in electrical engineering from Maharaja Sayajirao University of Baroda, India. During the next 30 years, he became a prominent professor and administrator at the University of Arkansas, Little Rock, where he earned numerous teaching honors and developed the Institute for Economic Advancement in the College of Business Administration. He also obtained a doctorate in finance from the University of Arkansas at Fayetteville. As the Joe T. Ford Chair of Finance, Vibhakar has returned to the University of Arkansas at Little Rock's College of Business Administration to help the continued expansion of strong working relationships with the banking, financial services and investment communities. In 2007, Vibhakar joined CFA, an organization with 128,000 members in 149 countries and territories, to serve as the managing director of its Asian-Pacific Operations, based in Hong Kong. His responsibilities included developing and implementing various operating strategies in the Asia-Pacific region, including member society relations, employer and university outreach, CFA Program candidate recruitment and support and member services. He more than doubled the market size in his 18-country territory and has operated with the philosophy that by putting investors’ interests first, markets function at their best and economies grow. He’s known by many as a passionate teacher, striving to improve his communities and an industry under national and global scrutiny. CFA Institute is the global association of investment professionals setting the standard for professional excellence and credentials. Talking about his experiences at what was then Central Missouri State University, Vibhakar noted that the university provided him "many learning opportunities beyond academics that I cherish today." He added that the value of creating a learning environment that makes learning easy and enjoyable was something he took away from his university experience. "It is that experience that guided my behavior in my job." 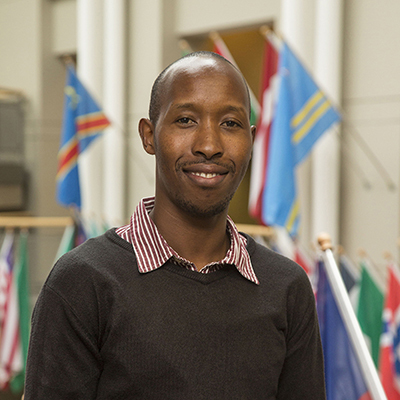 Vibhakar is the recipient of many teaching awards, both at the undergraduate and graduate level, that he attributes to what he learned at UCM.